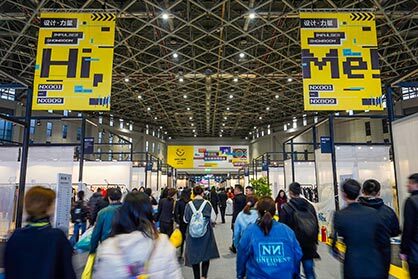 The spring event of CHIC China International Fashion Fair, Asia's largest and most important fashion and lifestyle fair from 12 to 14 March 2019, has again successfully completed with 103,722 visitors. The 1,365 national and international exhibitors with 1,453 brands from 16 countries and regions at over 117,200 sqm have presented themselves at the National Exhibition & Convention Center to visitors from all trade channels, including leading department stores, shopping centers, e-Commerce platforms, agents, distributors, multi-brand stores to wholesalers. The talks focused on trend information, cooperation talks and order inquiries. Chen Dapeng, president of CHIC and China National Garment Association: "The Chinese clothing market is undergoing a process of transformation at all levels, from procurement to production, from retailers to consumers. Digitization plays a key role in all areas, technical developments and AI are revolutionizing the fashion industry and trade, and the success factor for manufacturers and retailers is the indispensable information about the target group of customers. The challenge for all market participants will be to anticipate the changes in the market and to adapt to consumer needs. We are very pleased that, despite slowed growth in the market, more than 100,000 visitors have used CHIC as a trendsetting business platform for information, for cooperation agreements and order placement underlining the great importance of CHIC for the Chinese fashion industry and fashion retailers. New formats emerge, lifestyle is in demand and synergies are bundled. The young consumer, the economic driving force in the country, is the focus and integrated into all segments of the fair. " The exhibitors of the international area FASHION JOURNEY from Belgium, Germany, France, Hong Kong, Italy, Korea, Poland, Switzerland, Taiwan, the USA were very positive about their participation in the fair. Italy presented the largest European group participation. Under the roof of the Italian Trade Agency ITA, the Italian manufacturers presented themselves in a lavishly staged stand design, with an own catwalk area featuring Italian fashion two times per day to special VIP visitors invited by the ITA Shanghai Office and attracting crowds of people outside the pavilion watching the shows. Numerous promising cooperation talks took place, some exhibitors were able to place orders at the fair, such as Giorgio et Mario and Urbahia from France, Leguano from Germany, or Zhongqiao Resources from Hong Kong, who caused a stir with their color changing T-shirt model and recorded many orders. The organizers of the Korean show-in show PREVIEW in China were very pleased with their participation this year, many of their companies have placed orders and signed cooperation agreements for distribution in China. Epoque Hats from Poland, a newcomer at CHIC, has also successfully concluded the fair with customers from all over China, Korea, Japan and France. The order volume exceeded expectations. 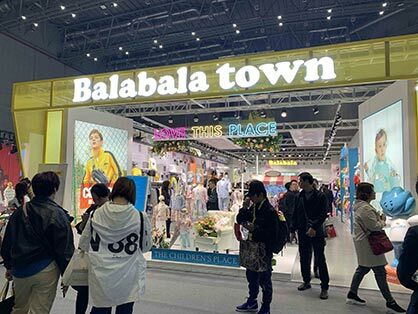 New formats were presented by exhibitors such as DICTION in the area of IMPULSES, an online platform and showroom for international designer brands, or Hangzhou E-Fashion Town in the womenswear section NEW LOOK. E-Fashion Town is an area in Hangzhou, supported by the government, which provides fashion brands, the infrastructure and network of all involved in the production and distribution of womenswear, a public platform for fashion shows, exchanges and communication and participation in international fashion platforms like CHIC. The Canadian brand JAC presented itself this time under the umbrella of E-Fashion Town at CHIC and received numerous inquiries at the fair. The brands Eifini and INXX in NEW LOOK also signed dozens of contracts with agents and franchisees. CHIC TAILORING, the new Bespoke area at CHIC, has attracted thousands of visitors. KuteSmart (formerly Red Collar) has welcomed many customers to the stand with its brand Cotte Yolan and presented its latest tailor-made technology. The customer chooses the design, the fabrics, the style and receives the finished product within 7 days. The complete process takes place via special apps. CHIC KIDZ also had a very successful kick-off as a new show-in show at CHIC, in addition to the market leader Balabala of the Semir Group, K-Boy & K-Girl presented themselves with young kidswear for new customer acquisition of department stores and shopping malls, the Dashang Group and Wanda Department Stores were won. Hush Puppies has found more than ten new agents for national distribution. Eton Kidd, a school uniform specialist, has won over 50 new customers and sees the participation in the fair as a complete success. At URBAN VIEW, market leaders such as GSON, Semir or the HODO group presented themselves and reported on a large number of inquiries for nationwide representations. TCH (Techno Chillout House), a UK label founded in 1989 in Bristol, drew visitors to the stand with a giant tiger head. With Topnine, Tilman, Covet Blan from Korea and 4cm, wookong (based on the monkey from the Chinese classic novel "The Journey to the West"), YZKK and Time Pop, the label of the Chinese movie star Zheng Kai, CHIC YOUNG BLOOD presented the trendy street wear labels , which caused a great sensation at the fair. The German label Leonardo, for the second time with the jewelry collection at CHIC, was very satisfied with his appearance in the SECRET STARS section. "CHIC was very positive for us, the combination of fashion and accessories is perfect, we have found more than ten potential very promising partners and will come back to the show to track customer contacts as well." Ms. Michelle Wong, Sales Manager. Ruediger, a hat label with German roots, was at CHIC for the third time and once again made important business contacts with representatives of all distribution channels, including key buyers such as the Jinguang Mall, as well as with important media such as Marie Claire China, who would like to work with Ruediger. The VIP Match Making meetings organized by CHIC with the Chinese trade for the international manufacturers have been used intensively. The online platforms JD.com and Koalo.com, one of the most dynamic websites launched in 2014, with Chinese consumers buying products from foreign brands have introduced themselves; so did DFO Showroom with five product categories and over 60 international apparel and accessories brands in its portfolio and all major retail formats including Galleries Lafayette, Harvey Nichols, Shangpin, Secco, etc. as customers. The agents of Folli Follie have presented the experiences of their entry into the Chinese market, as well as Iconix, which has got a joint venture with Material Girl and the Chinese brand Peacebird. Following the meetings, the company representatives continued discussions with the brands in the international pavilions on possible cooperation. On the occasion of a luncheon with VIP buyers such as the Dashang Group, one of the largest retailers in China with annual sales of more than RMB 200 billion through its department stores, shopping malls, super markets etc. or VETE, agent for international luxury brands, international bag and shoe brands had the opportunity to exchange ideas and make first contacts. The CHIC Matching event such as the Kids Fashion Brand Business Development Meeting, the Jewelry, Bags Procurement Demand Meeting for Key Buyers, or the Analysis of Consumption Motivation and Marketing Strategies presentation in the Context of Consumption Grading were packed with queuing visitors in the lobby showing the great need for information and exchange. Co-operation discussions were also held on the occasion of the Returning to the Top of Fashion banquet on the first evening of the fair, to which the CHIC Organizing Committee and Copenhagen Fur invited VIP guests. Market leaders such as the Vice-President of the Bosideng Group, Toread, Mukzin, Eifini, etc. have held intensive discussions there with major retail chains such as the Dashang Group, Tmall etc. The need for international brands in the leather and fur sector was particularly emphasized. Praised by the Chinese manufacturers was the CHIC APP, which made it possible to arrange appointments in advance of the fair with potential customers. The CHIC SHOWS staged the latest fashion trends, from the Lyshow Womenswear Original Design Release Show to the 2019 Dalang Cup China Women's Fashion Design Contest and the Yinji Fashion Show by Zhengzhou Yinji Department Store to the Overseas Brands Joint Release Show, which showcases the international design the CHIC presented.